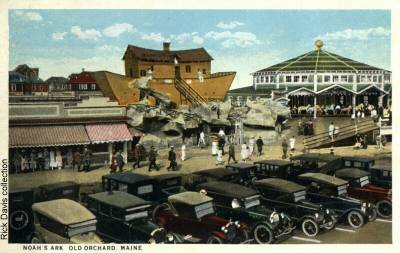 Long before the theming of parks became popular, many amusement rides had a theme. 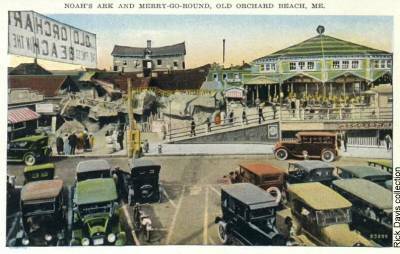 This was done mostly with scenic railways, old mills and dark rides. 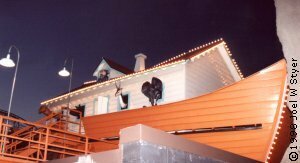 While the Noahs Ark is a walk through attraction, it is still part of the dark ride "family". 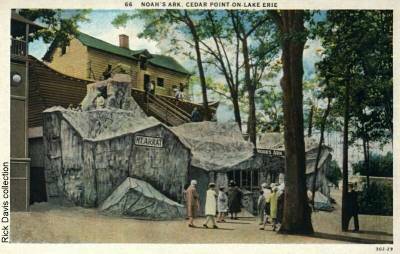 In a sense, the Noahs Ark is a ride more so than other funhouse attractions due to the constant rocking of the vessel. The original Noahs Ark is a familiar bible story that almost everyone knows. Noah was to build an ark capable of carrying two of each animal (more in some cases). He was to then board the ark with his family and animals, while it would rain for forty days and forty nights. It is said that after the rains had stopped, the ark came to rest on Mt. Ararat. 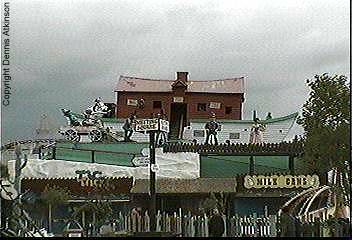 It is the popularity of this story that led to one of the most duplicated funhouse style attractions ever. The first Noahs Ark appeared at Venice Pier (California) in 1919. The ride was designed and built by Leroy Ramond who sold the manufacturing rights to William Dentzel the following year. 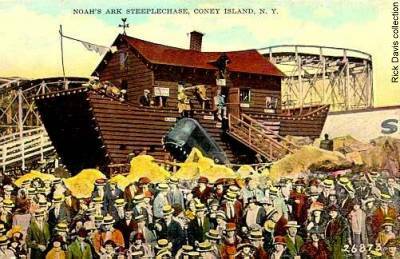 After that, the ride was duplicated many times by Dentzels Noahs Ark Company at amusement parks throughout the United States and other countries. In 1928, William Dentzel died and the company changed its name to the American Amusement Construction Company. 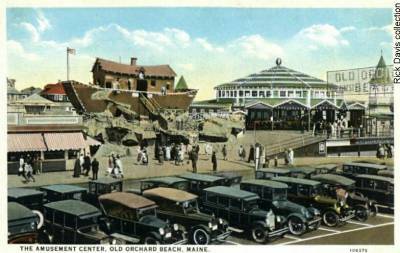 The original ride burned in the 1940s and one by one all but three of the rides disappeared. The only ride remaining in the North America is at Kennywood Park in Pittsburgh, PA. They originally wanted to build an Ark in the 1920s but the great depression delayed their plans until 1935. Kennywoods Ark was built by the Philadelphia Toboggan Company (now Philadelphia Toboggan Coasters), who had acquired the rights to build the Arks. The Kennywood Ark was the last one ever produced. 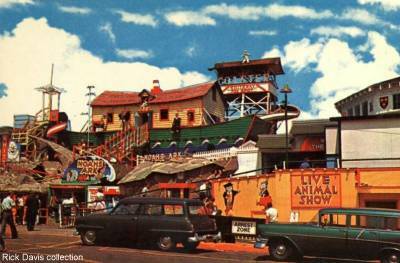 It was completely refurbished in 1969 with new scenes, animals and stunts. The famous whale entrance was also added at that time along with a new, larger mountain. 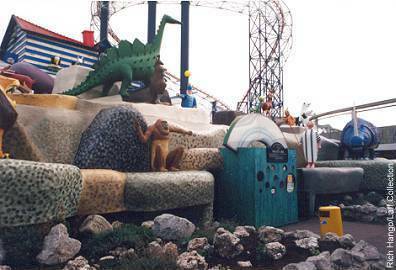 The 1996-97 season saw another major refurbishment to assure that the Ark will last for another generation. The only other two operating rides are in the United Kingdom at Blackpool Pleasure Beach and Frontierland. 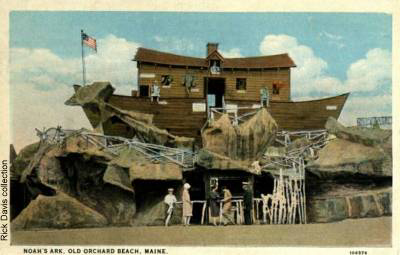 The ride is a wooden boat placed upon what appears to be a jagged pile of rocks. This is to simulate its supposed resting-place on Mt. Ararat. The animals gander out the windows, looking over those who enter. The walking pattern within the Ark varied by installation. Some Arks were entered at the bottom level and others a ramp or steps to the top. The current Kennywood Ark uses an elevator. The Ark is not one large room but long winding passageways. At one point the passage would lead to another level. The exit of the ride could have been a simple doorway or a slide from the upper level. A number of "stunts" or gags were used throughout the ride. The number of stunts also varied by installation. Some were static such as the animals or Noahs family members sitting in a diorama. An operator triggered some gags when unsuspecting guest gets close enough. This is the case with the blast of air that would blow the skirts of women up into the air. Usually done in full view of the park patrons, this was a common stunt in many funhouses. Crowds would gather just to watch. Another popular stunt used was the shaker boards or barrels. These were vibrating boards (or barrel tops) on the floor that caused a loss of balance. In the old days, you had to transverse these in order to continue with the ride. In these modern litigious times, a bypass is now provided for those who choose not to participate.Another impediment to walking through the ride is the balancing walk. This is where you seemingly have to walk on small stones or narrow board to complete your journey. It appears that there is a large drop with vicious critters waiting to devour you if you should slip. And in the pit below you are the skeletal remains of those who should have been more careful. Of course it is only your imagination that puts you in danger, a clear piece of glass (now PlexiglasTM) prevents the catastrophe that appears so real. Between these highly active moments are a multitude of dioramas and displays. In older days, there were more mechanical stunts than static displays to provide thrills but many have disappeared due to safety concerns. Sound also played an important part in the Arks. Whether it be the soothing sound of rain, thunder and lightning or Noah himself barking at you to move, the sounds added one more dimension to all that was happening. Small details also played an important part. Many of the corridors use "forced perspective"1 to create the illusion that the pathway is longer than it is or to give you the feeling that it will become too small to pass through. All the while you experience these effects, the entire boat is slowly rocking back and forth just to keep you a bit more off balance and reinforce the notion that you are indeed on a boat. 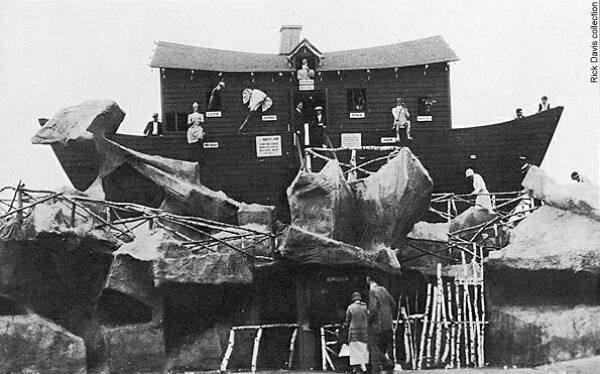 While much of this information is based on Kennywoods Ark, most of the stunts were common to many funhouse attractions. For the 1986 rebuilding, they made several unique additions. As you enter, no longer do you have to walk up the steps but you must now take the elevator. This is no ordinary elevator but the "elevator of doom". The effect is of an elevator plunging out of control. Just before exiting the ride, you enter the flooding chamber. As you stand there, a quite large amount of water is poured just inches away and gives the illusion that the room will be flooded. But there is more to Noahs Ark than meets the eye. There is the mechanism that rocks the boat as well as those for the other mechanical gags. There also has to be ducts for electric, air ventilation and water throughout the ride. These are ingeniously woven in between the pathways that you follow. The boat rocking mechanism though is by far the largest. It consists of a large motor that drives a set of gears. The gears drive a shaft, which pushes or pulls on wooden supports that are designed for the rocking motion. The setup is quite ingenious and simple. 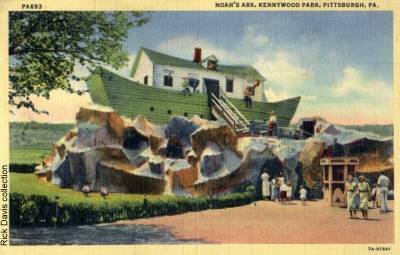 Upon your next visit to Kennywood or one of the two UK parks, take the time to go back in time and ride the Noahs Ark. It is bound to bring a smile to your face. 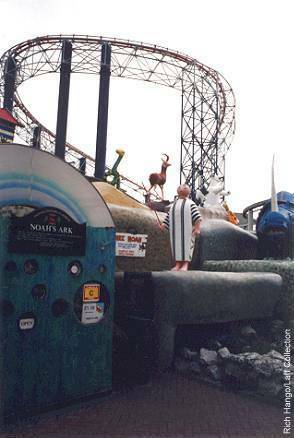 left and above: Photos of the Noah's Ark attraction at Blackpool Pleasure Beach in the UK. To the left is the Noah's Ark at Frontierland in the UK. This and the Blackpool Ark above are the two remaining Noah's Ark attractions in addition to Kennywood's. All three parksshould be commended for keeping these rides. 1 Forced Perspective is the illusion of making something seem bigger than it really is. In the case of the Noahs Ark, the far end of the hallways were smaller to make them appear longer. Mike Costello for information on the Arks and for a list of parks that once owned one. Rick Davis for providing many postcards and the extraordinary photographs of the Kennywood ride and its mechanical components. Dennis Atkinson for the photos of the Blackpool, UK Ark. Photos are © Rick Davis, Dennis Atkinson and Joel Styer as noted. 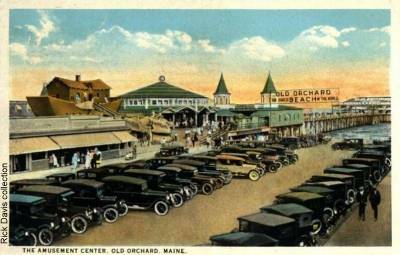 Postcards are from the Rick Davis collection unless noted. This article is © 1999 by Joel Styer. All used with permission. Contents © 1999 Laff In The Dark unless otherwise noted. All rights reserved.